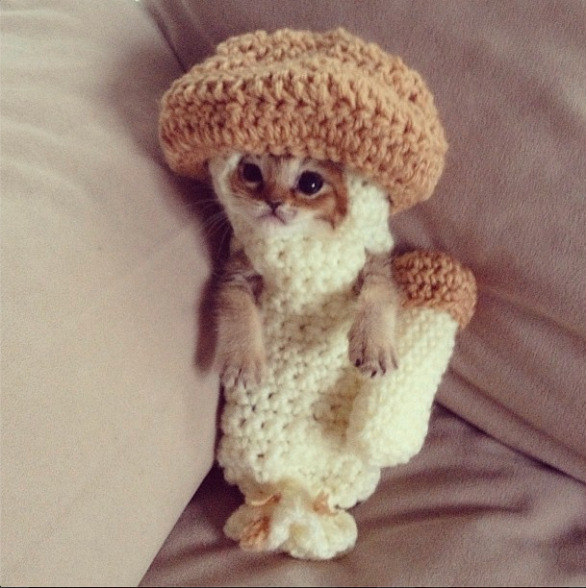 Earlier this week, a photo of an adorable, tiny kitten wearing what appeared to be a crocheted mushroom suit exploded on Reddit, cat blogs and animal-lovers' Twitter feeds. Here's the picture we're talking about. If you react normally, everyone within a 30-foot radius should come flocking to your computer or phone to see what you're squealing about. Before anyone becomes alarmed, this kitten named Wasabi-chan is wearing this odd, yet adorable, getup because it was necessary for her survival. The teeny, tiny kitten was found last month on a street in Japan, having barely survived an attack by a vicious crow. The bird fractured the kitten's jaw, tore its tongue and left a hole in the back of its throat. While these are all horrifying details, Wasabi-chan now looks to have mostly healed from the traumatic experience since being rescued by her caretakers and new family. But what's with the silly mushroom suit? Because the tiny kitten had sustained pretty severe injuries to her mouth and throat, she needed to be fed through a feeding tube and, as anyone could imagine, the process wasn't much fun for her. She reacted to the feedings — necessary for her to heal and survive — quite violently and, despite her small size, she proved difficult to restrain. Then came Grandma to the rescue! The kitten's owner's grandmother crocheted the mushroom suit, and a few other get-ups pictured here, to aid in gently restraining Wasabi-chan during her feedings. Even though the kitten was dressed in the costumes for her own benefit, Internet trolls whined about it, claiming the owner was being cruel for putting the kitten through such an experience. 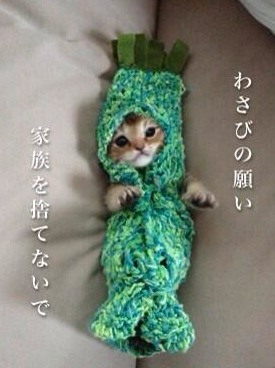 Because of that, Wasabi-chan's owner stopped posting photos of the kitten wearing its feeding "straightjackets." Even though her owner isn't posting more photos of the kitten in the crocheted creations, "naked" Wasabi-chan is just as cute. She's gained thousands of followers in just the past week, charming everyone with her round, wide eyes, tiny size and a short, crooked tail. 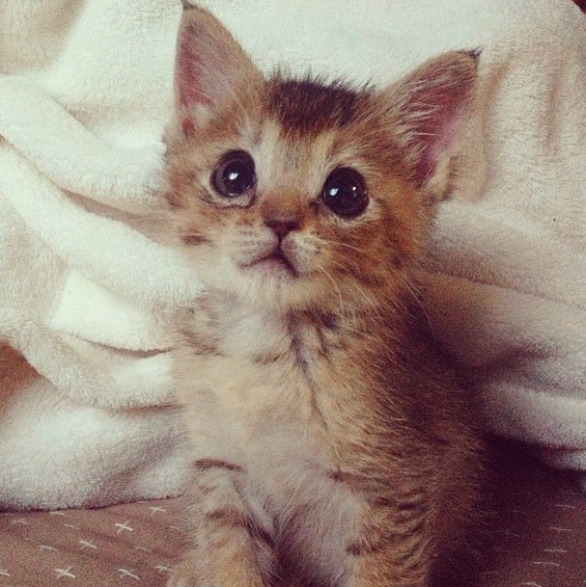 Follow this lucky little kitten's progress on Instagram and Twitter for daily updates.